Digital Imaging PhotoNewbury Park Orthodontics has a full digital imaging lab on-site, employing the latest technology in digital imagery. We have the ability to take all records, including full digital x-rays, at our facility. 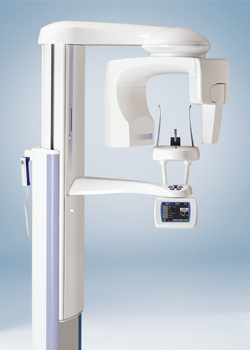 This eliminates the need to go to an outside lab for any x-rays or records. 3D Cone Beam Scans- Cone scanning takes a full image of your skull, the functionality of your jaw and the position of your teeth. This is helpful for orthodontic and dental purposes. The scan takes 18-seconds and allows your doctor to see all the bones in your face as well as your teeth, in color and in 3D. Digital Panoramic X-Rays- These images allow us to see all the teeth together in one image. This is a huge developmental step in treatment, enabling us to capture everything we need in one image, rather than multiple, which time-effecting and ore comfortable for the patient. At Newbury Park Orthodontics, we are dedicated to staying up to date on the latest technology is order to provide you with the best care possible. These new additions to our office increase the effectiveness and the efficiency of your treatment, enabling us to provide you with the highest quality of care. To schedule an appointment, feel free to contact our office at any time. We look forward to seeing you soon.